The jubilant coach of England was pleased with the performance of his team as the tour against Pakistan was coming to end and his team was emerging as winners. The world no.1 was shocked when they were knocked out 3-0 in the Test series by the ordinary looking Pakistan team in their early part of the tour. Englishmen were mesmerized by the quality spin bowling of Pakistan as their lethal duo of Saeed Ajmal and Abdur Rehman, ripped through their batting. They grabbed 43 wickets in the series where Ajmal was unplayable and became the top wicket taker by punching out their 24 batsmen. He was declared ‘Player of the series’ and his fellow leg spinner, Rehman grasped 19 wickets and both became a cause of concern for the visitors. England assessed their weaknesses in the longer version of the game and hit back hardly at Pakistan by achieving a whitewash of 4-0 in One Day Internationals. They had their home work prior to the start of the ODIs and negotiated the threatening spin attack of the hosts at their best. The spinners who were destructive in the Test series looked ordinary and could manage just 14 wickets in four games. Ajmal made some impression by claiming 10 wickets as Shahid Afridi held three in four games and Rehman just one in two games. England emerged winners in the second T20 by a huge margin of 38 runs when Jonny Bairstow played a heroic knock at a crucial stage of the match. He smashed unbeaten 60 off 46 balls with the assistance of two sixes and 5 fours as his team managed 150 runs for the loss of seven wickets. Pakistan was bowled out for 112 runs in 18.2 overs as English bowlers raided at their casual looking batting. 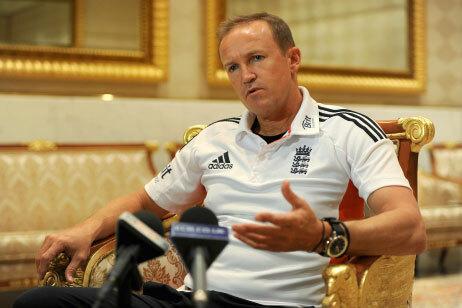 The third and deciding T20 will be played at Sheihk Zayed Stadium, Abu Dhabi on February 27, 2012 and Flower was anticipating winning the series.